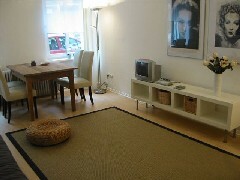 2-room apartment - It has a living/sleeping area, a bed area, a kitchen, shower, Access to the internet (WLan), digital-TV. The floors are made of timber, kitchen and bathroom are terracotta-tiled. Close to the S-Bahn (surburban railroad) Bornholmer Street und S-Bahn and tube-station Schoenhauser Allee. 1 bis 2 persons 60,00 Euro - each additonal person 15 euro. 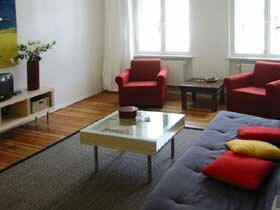 2-room apartment - It has a living/sleeping room, a bedroom, a kitchen, shower, Access to the internet (WLan), digital-TV. The floors are made of timber, kitchen and bathroom are terracotta-tiled. Close to the S-Bahn (surburban railroad) Bornholmer Street und S-Bahn and und tube-station Schoenhauser Allee. 1 bis 2 persons 60,00 euro - each additonal person 15,00 euro. 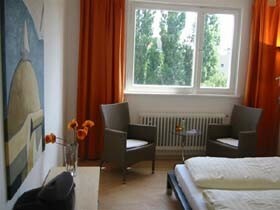 2-room apartment - It has a living/sleeping room, a bedroom, a kitchen, shower, Access to the internet (WLan), digital-TV. The floors are made of timber, kitchen and bathroom are terracotta-tiled. Close to the S-Bahn (surburban railroad) Bornholmer Street und S-Bahn and tube-station Schoenhauser Allee. 2-room apartment - It has a living/sleeping room, a bedroom, a kitchen, shower, digital-TV. The floors are made of timber, kitchen and bathroom are terracotta-tiled. Close to the S-Bahn (surburban railroad) Bornholmer Street und S-Bahn and tube-station Schönhauser Allee. 2-room apartment - It has a living/sleeping room, a bedroom, a kitchen anda shower, digital-TV. The floors are made of timber, kitchen and bathroom are terracotta-tiled. Close to the S-Bahn (surburban railroad) Bornholmer Street and S-Bahn and tube-station Schoenhauser Allee. 2-room apartment - It has a living/sleeping room, a bedroom, a kitchen, shower, digital-TV. The floors are made of timber, kitchen and bathroom are terracotta-tiled. Close to the S-Bahn (surburban railroad) Bornholmer Street and S- and tube-station Schönhauser Allee. 2-room apartment - It has a living/sleeping room, a bedroom, a kitchen, shower, digital-TV. The floors are made of timber, kitchen and bathroom are terracotta-tiled. Close to the S-Bahn (surburban railroad) Bornholmer Street. 2-room apartment - It has a living/sleeping room, a bedroom, a kitchen, shower, digital-TV. The floors are made of timber, kitchen and bathroom are terracotta-tiled. Close to the S-Bahn (surburban railroad) Bornholmer Street and S- Bahn and tube station Schoenhauser Allee. 2-room apartment - It has a living/sleeping room, a bedroom, a kitchen, shower,digital-TV. The floors are made of timber, kitchen and bathroom are terracotta-tiled. With the bus line 187 a short way to the S-Bahn (surburban railroad) Schoeneberg. 2-room apartment - It has a living/sleeping room, a bedroom, a kitchen, shower,digital-TV. The floors are made of timber, kitchen and bathroom are terracotta-tiled. Close to the S-Bahn (surburban railroad) and tube-station Schoenhauser Allee. 2-room apartment - It has a living/sleeping room, a bedroom, a kitchen, shower, digital-TV. The floors are made of timber, kitchen and bathroom are terracotta-tiled. Close to the S-Bahn (surburban railroad) and tube-station Schönhauser Allee. 2-room apartment (2 floors) - It has a living/sleeping area, a bed area, a kitchen, shower, digital-TV and radio. The floors are made of timber, kitchen and bathroom are terracotta-tiled. Close to the S-Bahn (surburban railroad) and tube-station Schoenhauser Allee. 2-room apartment - It has a living/sleeping room, a bedroom, a kitchen, shower, digital-TV. The floors are made of timber, kitchen and bathroom are terracotta-tiled. Close to the S-Bahn (surburban railroad) and tube-station Schoenhauser Allee. 2-room apartment (2 floors) - It has a living/sleeping area, a bedroom, a kitchen, shower, digital-TV. The floors are made of timber, kitchen and bathroom are terracotta-tiled. Close to the S-Bahn (surburban railroad) and tube-station Schoenhauser Allee. 2-room apartment - It has a living/sleeping room, a bedroom, a kitchen, shower, digital-TV. The floors are made of timber, kitchen and bathroom are terracotta-tiled. Baker shops, groceries and a supermarket are close by. Close to the tube-station Oranienburger Street and the S-Bahn (surburban railroad) Nordbahnhof. 1 bis 2 persons 65,00 euro - each additonal person 15,00 euro. 2-room apartment - It has a living/sleeping room, a bedroom, a kitchen, shower, digital-TV. The floors are made of timber, kitchen and bathroom are terracotta-tiled. Close to the tube-station Birkenstreet. 2-room apartment - It has a living/sleeping room, a bedroom and a kitchen, ashower, digital-TV. The floors are made of timber, kitchen and bathroom are terracotta-tiled. Close to the tube-station Birkenstreet. 2-room apartment - It has a living/sleeping room, a bed room, a kitchen, shower, TV and radio. The floors are made of timber, kitchen and bathroom are terracotta-tiled. Close to the S-Bahn (surburban railroad) Beusselstreet.